In Kayla Harrison, U.S. Has Chance For Judo Gold, And A 'Comeback Kid' Story : The Torch Kayla Harrison, 22, is the best chance the United States has to win its first Olympic gold medal in the sport of judo. Like many of the world's best athletes, Harrison's road to London wasn't easy. 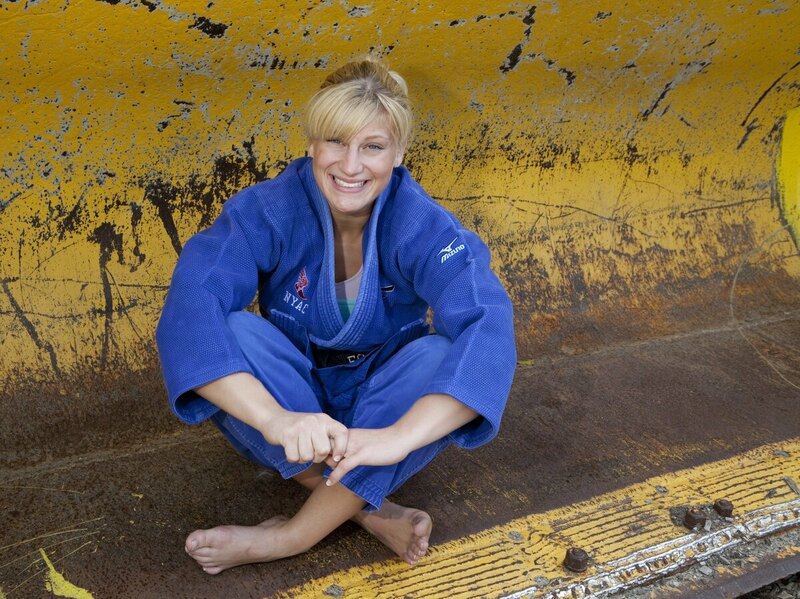 Kayla Harrison, who is on the U.S. judo team, is going to the Olympics for the first time. Kayla Harrison, 22, is the best chance the United States has to win its first Olympic gold medal in the sport of judo. Like many of the world's best athletes, Harrison's road to London wasn't easy. Since she was little, Kayla Harrison has only had two goals. To win a world championship, which she did in 2010, and to win an Olympic gold medal, which she'll attempt for the first time in London. "I can't believe it's here. I'm so excited and I'm ready to go," she says, her voice dropping to a whisper with excitement. But on the second-to-the-last morning of the team's final official training camp before the Olympics, Harrison is frustrated. As she tries the same move again and again, only to have it fail against her bigger, stronger, male sparring partners, Harrison looks for help from USA Judo assistant coach, "Big Jim" Pedro. "Nah, you can't chicken wing and let go, Kayla," Pedro answers. "It's a waste of an attack. You can't chicken wing and let go." "Big Jim" is known for yelling at his athletes; Harrison has heard plenty. Pedro became her surrogate father figure when she moved to Wakefield, Mass., from Middletown, Ohio, at the age of 16. "Thing with Kayla is that I never stopped yelling at her," he says, "because I wanted her to get better. But I do a lot more talking to her, you know. I talked to her an awful lot, I still do now. You know we talk all the time, about life and her problems." The "problems" to which Pedro euphemistically refers had started by the time Harrison was 13, when her judo coach in Ohio began sexually abusing her. When Harrison's mom, Jeannie Yazell, found out, she saw judo not only as the means by which an abuser had gained access to her daughter, but also the means to her daughter's recovery. "I knew she loved judo, and that that would pull her back in," she says. To put distance between Harrison and her abuser while he was awaiting trial, Yazell sent her daughter to Massachusetts, to train with the Pedros — "Big Jim" and his son, Jimmy, who is the head coach of Team USA. "We're real people," Big Jim says, "and had real conversations with her. And you can't treat her with kid gloves, and pity her and feel sorry for her. You have to sort of let her know that you need to face it, you need to end it, and you need to move on, and use it to make you a stronger person." At first, Harrison says, she hated the Pedros, her mother, and judo. But eventually, the sport became the outlet for the negative emotions that had built up over years of abuse. Earlier this year, Harrison finally found herself at peace. But, infuriated by the Penn State child abuse scandal, she decided to speak out. It's a decision that has brought uncomfortable questions, but she has no regrets. "Do I wish that everyone would just talk about how, you know, awesome I am — and how I could be America's first gold medalist? Yes, I wish that," she says. "But America wants that comeback kid story. They want the person who overcame obstacles to reach their goals. And I fit that bill pretty well." Jeannie Yazell says her daughter was always strong enough to be an Olympian. But if she were to bring home Olympic gold, it would be even more proof that Kayla Harrison is stronger than her former abuser. Karen Given is a producer for Only A Game, produced by WBUR.